Transi(en)t Manila closes this year's edition with a presentation by Yang Yeung on plans for Project Glocal STAMPED! which documents this art journey over its last few iterations. She will also present primer on soundpocket, the first organization in HongKong dedicated to promoting sound art of which she is the founder and executive director. Catch Yang Yeung at 98B COLLABoratory this Sunday, November 30 at 3:00 PM in Escolta. Admission is free. Have you ever dreamed of becoming a VJ? 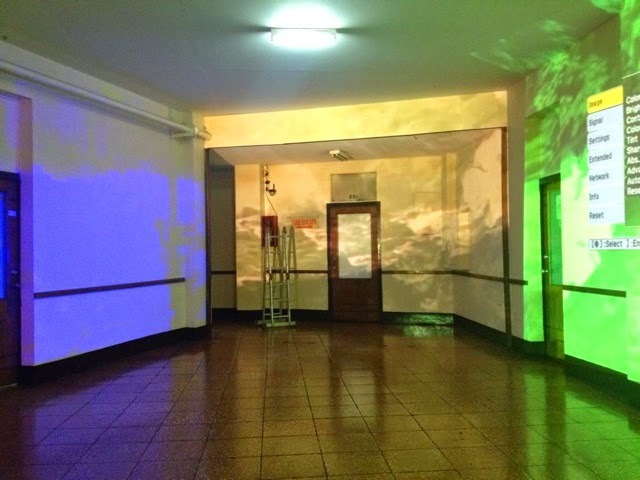 Urich Lau transforms the second floor lobby of the Regina Building into an interactive screen where footage from the aftermaths of typhoons Yolanda and Glenda are projected and the viewer must play the video jock. How does one describe the ruins and destruction with the cheerfulness required in front of the blue and green screen? 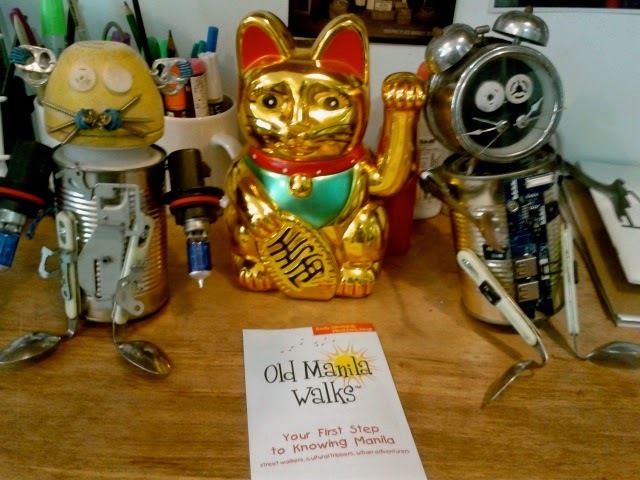 This Saturday, 29 November, do not miss this chance to experience art, technology, heritage and people along Escolta. All artworks/installations made by Transi(en)t Manila artists in their laboratories and spaces will be open to the public by 10AM. You can choose to explore the activated spaces on your own: Check out our logarithm-created loomband Rizal at the Juan Luna building, explore the street with a cellphone-activated robot drone, trade your stories for a drink at the Teoff, surround yourself with sound at the Calvo Building. Experience the "ghost" at First United. But it will be a special kind of fun to join Project Glocal founder and lead curator Dayang Yraola in a walk through of all the artist-activated spaces along Escolta. Each stop will allow us to interact with the installation, have a conversation with the artists, have a drink, and experience art in a new light. 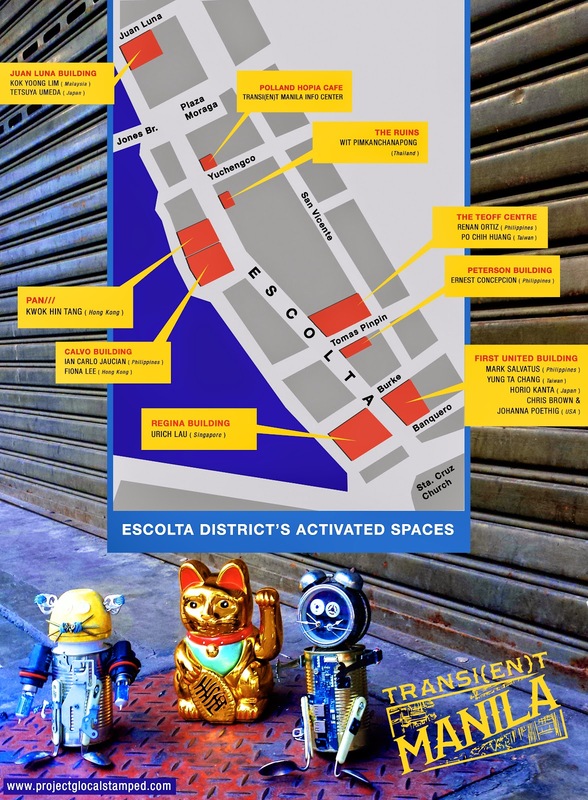 Map of Escolta's activated spaces. Walk through begins at the farthest end--there on the tippity top. Tell everyone. Bring your friends. Share the experience of art in a fun, interactive way. Come and let us all have fun. at the College of St. Benilde's School of Design and Arts. Project Glocal goes to the College of St. Benilde's School of Design and Arts for a day of demonstrations, talks and workshops on Thursday, November 27. The day opens with demonstrations from two of our Transi(en)t Manila artists at the Museum of Contemporary Art and Design (MCAD). From 10:30AM to 12 noon, Filipino Ian Carlo Jaucian will provide a demonstration of DIY robots, which includes his mobile phone-controlled drone. From 1:30PM to 3:00PM, Yung Ta Chang of Taiwan will show how to take real-world signals like voice, audio, video, temperature and pressure, and then use mathematics to turn them into digital signals. He will then combine these processed digital signals into a performance. There will be a talk on art+technology+heritage+people. Transi(en)t Manila's resident artists Horio Kanta of Japan and Wit Pimkanchanapong of Thailand will be joined by curator and artist J Pacena and heritage conservation architect Dominic Galicia. The talk will be from 3:30-5:00PM also at MCAD. The day's events will culminate in a workshop on making soup, lead by artists Daiya Aida and Hattori Hiyoruki from Japan. This will take place at the SDA Cafeteria on the 12th floor, from 5:30 to 7:00PM. All activities are free. 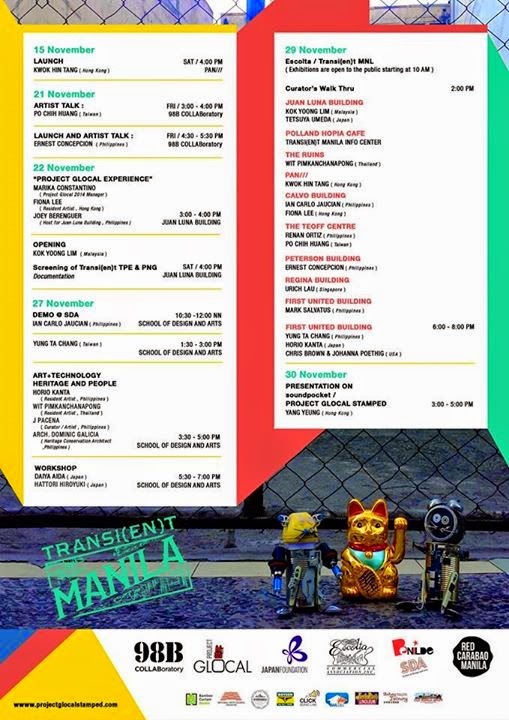 Email us at transientmanilaevents@gmail.com or check the Facebook events page here. 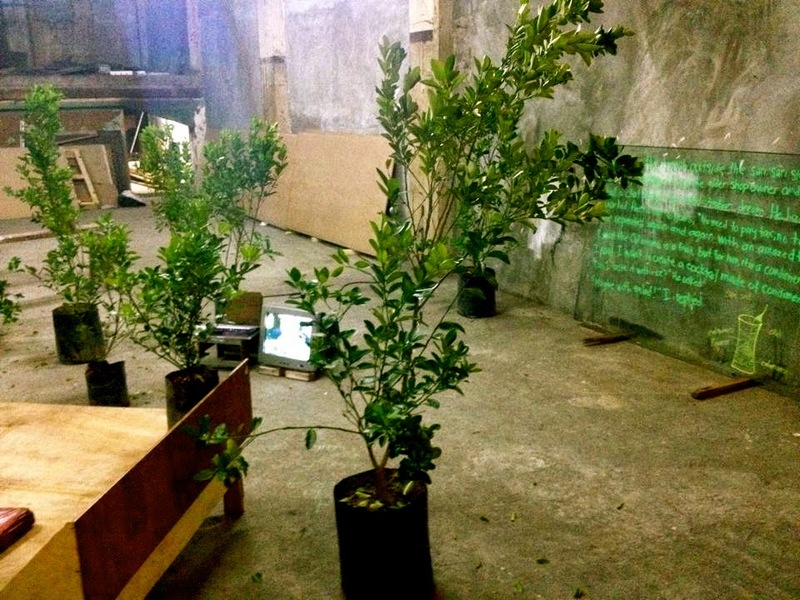 Taiwanese artist Po Chih Huang is interested in two things for his project: to know more about the storied past of the Escolta district, where Transi(en)t Manila finds its home, and to develop a drink made from the local calamansi. His interest in developing a drink made from citrus fruits stems from his award winning Five Hundred Lemon Trees project, where he previously sold wine labels in exchange for funds to buy the said 500 lemon trees, which he then planted and from which he hopes to harvest enough fruit to turn into wine in the next couple of years. Upon arrival in Manila, he first noticed how ubiquitous calamansi is. Filipinos can't seem to live without it. We drink it as juice, we use it in our sawsawan in almost every meal. 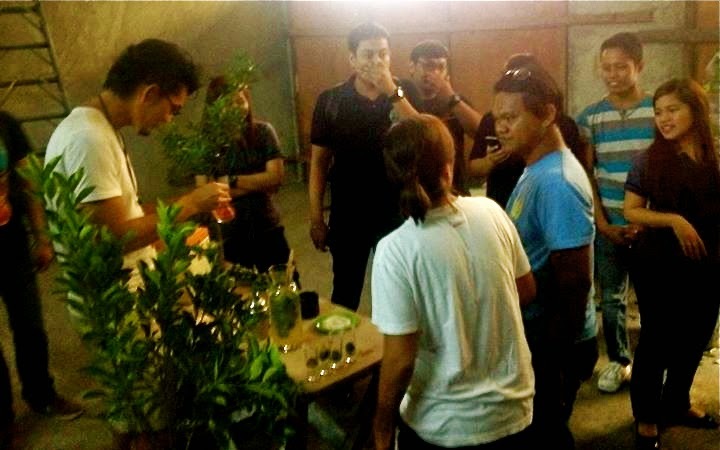 Po Chih and Chien Yu then chanced upon a locally made calamansi liqueur and found inspiration from it. 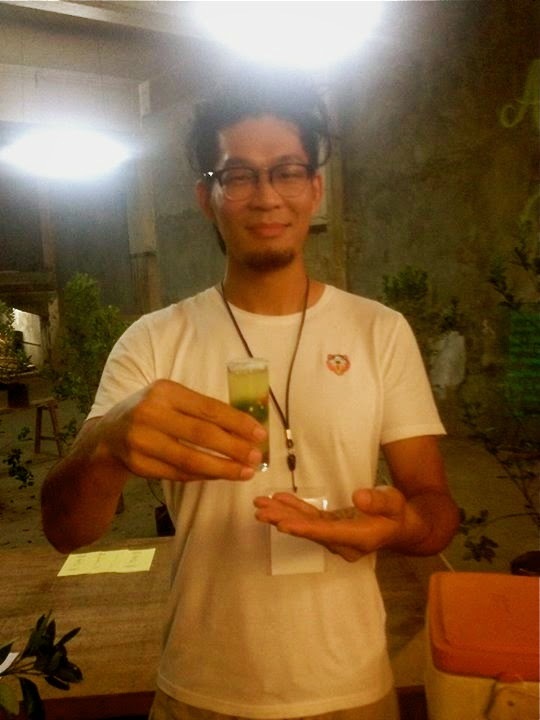 Po Chih called his calamansi-based drink "Manila Research," which is an apt name for something that combines history, art and alcoholic alchemy. Po Chih Huang mixes history and art and turns it into a really nice drink. Add this to wanting to find out more about Escolta. Thus was born an idea for his laboratory. 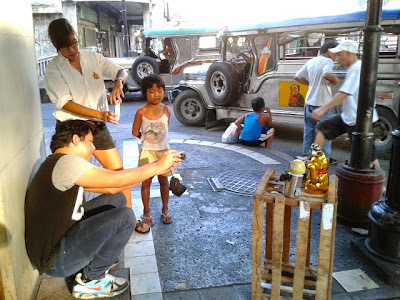 Why not ask Manila locals for stories about the districit, and in exchange, he would give them a sample of the drink he's developing based on calamansi? It's quite a combination: history and mixology, tales and cocktales. The laboratory at TEOFF in Escolta. 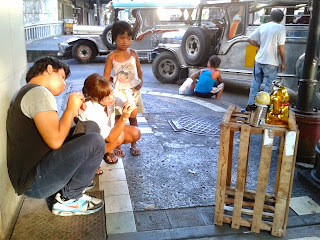 It was happy hour in the middle of the day, in the middle of Escolta. The would be tellers came in, more than happy to tell their tales, but also curious about the strange brew that was promised. It was a happy exchange indeed. 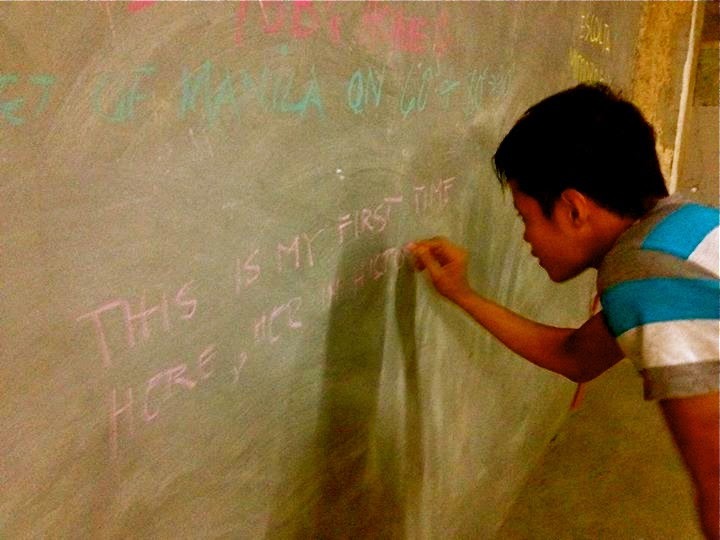 A first timer leaves his mark on Po Chih's lab wall. And we're not done. Come again tomorrow, 26 November, Wednesday, between 12:30-1:30 PM, and again on Saturday, 29 November at 2PM onwards at the TEOFF in Escolta. Tell us your stories. We'll give you a drink. More photos from Dayang Yraola's Facebook post. Po Chih Huang and Chien-yu's laboratory is ready! 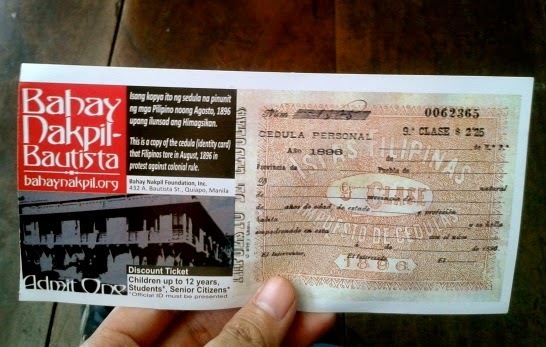 We are collecting stories about Escolta. For every story you share with us, we will give you a shot of Po Chih's unusual brew. Come to the Teoff Center (old Navidad building) along Escolta on November 25 and 26, between 12:30-1:30PM, and on November 29th during the curator's walk through. Find our Taiwanese artists Po Chih Huang and Chien Yu. Tell them your tales about Manila's queen of streets, and you get a drink that they brewed themselves. Cool trade, yeah? You tell us a story. We give you a drink. We'll be waiting for you. 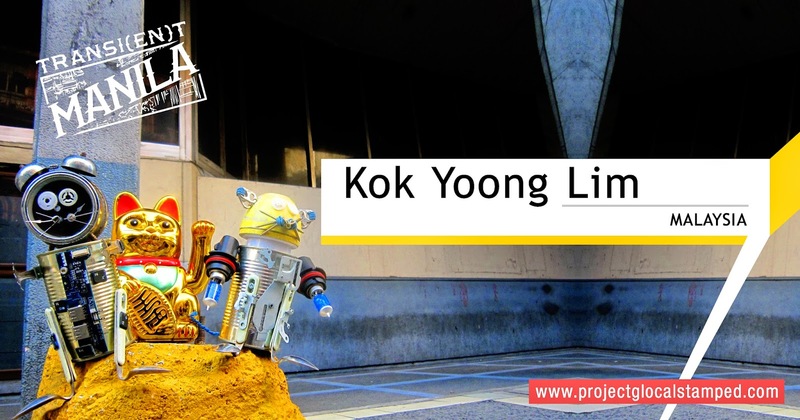 Kuala Lumpur based Malaysian artist Kok Yoong Lim works with new technologies to explore and investigate the human dimension of technological development and discourse. Most of his works take the form of (interactive) installation. Kok Yoong Lim was in Manila last September to give his artist's talk, and also to explore and get inspired by Escolta and its environs. 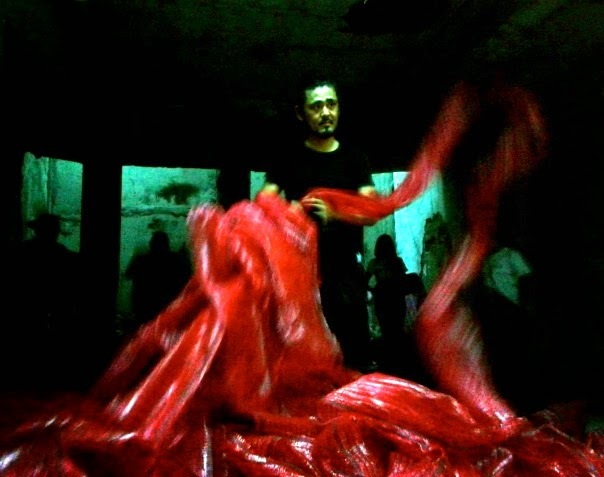 Check out what he has in store for Manila when his installation for Trasi(en)t Manila opens at the Juan Luna Building in Escolta, Manila on 22 November, Saturday. Read what Kok Yoong Lim has to say about his art and philosophy during his previous artist talk here. To find out more about the artist and his works, check out his website here. Sounds like a band name. But we really just rock! What is it like to mount a project that gathers multiple international artists to participate in lightning residencies creating site-specific art in towns and cities and spanning several years and themes? It's definitely not an easy task, but Project Glocal's various iterations prove that it's possible and doable.Listen in on the conversation as Marika Constantino, Fiona Lee and Joey Berenguer share their Project Glocal experience from their own different vantage points. Marika is this year's Project Glocal manager; Fiona is a Hongkong artist participating in Transi(en)t Manila; and Joey Berenguer is the host for Juan Luna Building in Escolta, which is one of the activated spaces in Transi(en)t Manila. 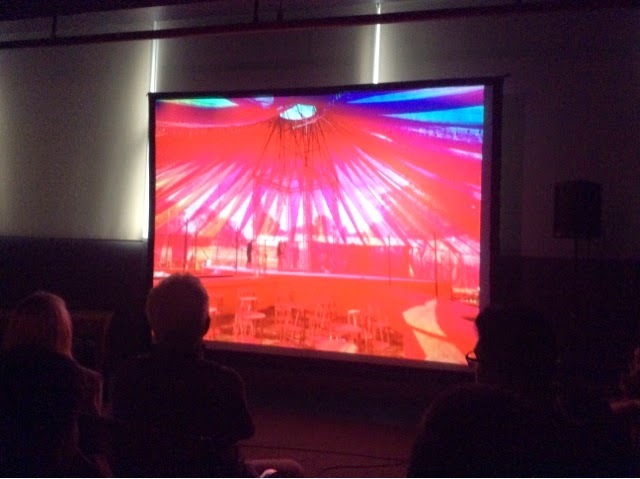 To amplify the experience, the documentation of Transi(en)t Taipei and Penang editions will be screened at 4PM. Join them on 22 November, Saturday. The talk starts at 3PM. Screening will be at 4PM. All at the Juan Luna Building. 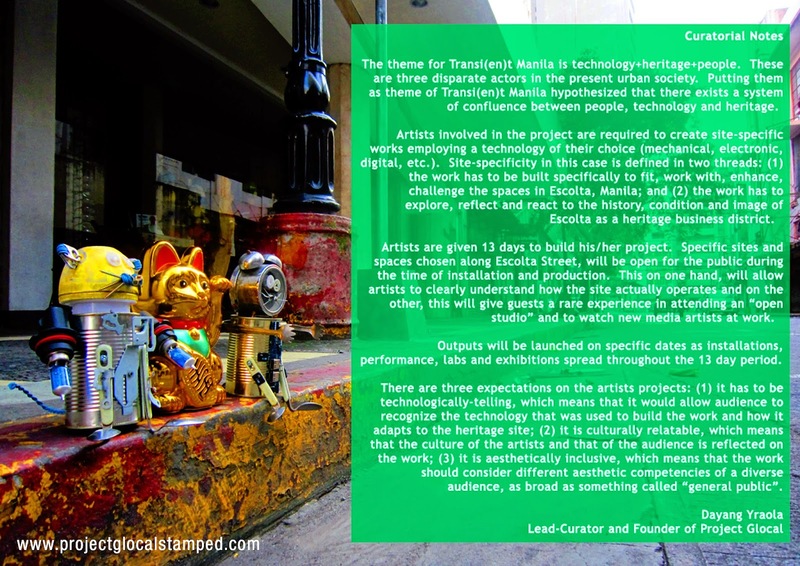 The theme for Transi(en)t Manila is technology+heritage+people. These are three disparate actors in the present urban society. Putting them as theme of Transi(en)t Manila hypothesized that there exists a system of confluence between people, technology and heritage. Artists involved in the project are required to create site-specific works employing a technology of their choice (mechanical, electronic, digital, etc.). Site-specificity in this case is defined in two threads: (1) the work has to be built specifically to fit, work with, enhance, challenge the spaces in Escolta, Manila; and (2) the work has to explore, reflect and react to the history, condition and image of Escolta as heritage business district. Artists are given 13 days to build his/her project. Specific sites and spaces chosen along Escolta Street will be open to the public during the time of installation and production. This, on one hand, will allow artists to clearly understand how the site actually operates, and on the other, this will give guests a rare experience in attending an "open studio" and to watch the new media artists at work. Outputs will be launched on specific dates as installations, performance, labs and exhibitions spread throughout the thirteen day period. There are three expectations on the artists projects: (1) it has to be technologically-telling, which means that it would allow the audience to recognize the technology that was used to build the work and how it adapts to the heritage site; (2) it is culturally relatable, which means that the culture of the artists and that of the audience is reflected on the work; (3) it is aesthetically inclusive, which means that the work should consider different aesthetic competencies of a diverse audience, as broad as something called the "general public." Project Glocal teamed up with Old Manila Walks to give Transi(en)t Manila’s artists not just a look at what the city streets have to offer, but also to provide inspiration and insight that the artists may infuse into their art. Ivan ManDy lead us from 98B’s headquarters in Escolta down the road to Sta. 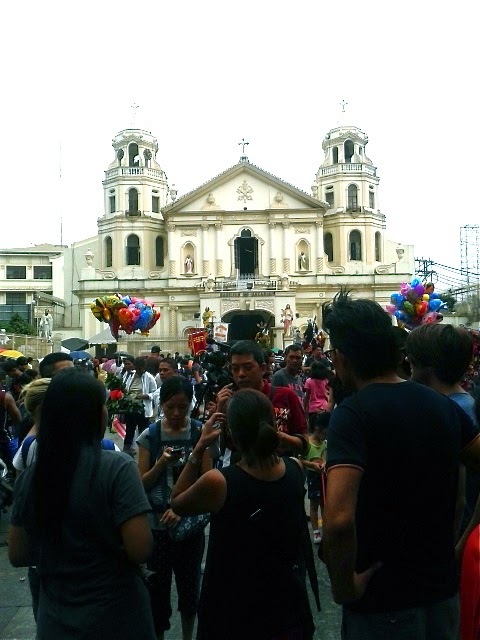 Cruz Church, situated in the heart of Manila’s downtown. A quick backgrounder of Manila’s (and the country’s) colonial history explained why the heritage areas of Sta. Cruz, Quiapo and Binondo were once important to the country’s social, economic and cultural fabric, but has slowly decayed as the city’s centers migrated elsewhere. 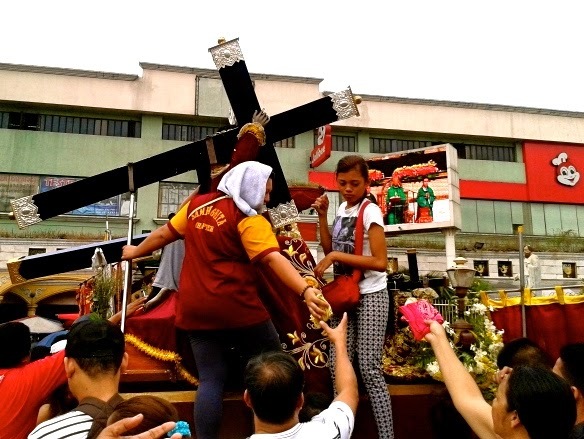 The Black Nazarene attracts believers from all walks of life. But more than that, early Sunday morning on the church patio opens one up to what is important to the Philippines as a people: a curious mix of faith and enterprise. At Plaza Miranda, several replicas of the Nazareno draw curious crowds of believers, street urchins bearing religious amulets are quick to wrap them around wrists and limbs and then ask for donations, there are people you can ask to pray for you, or even light a candle for specific blessings one desires. The Hidalgo Underpass is now an almost clean but well-lighted place. Down the newly renovated Hidalgo underpass, the dinginess has disappeared in the bright lights. There are many things to see and buy and eat. But as one emerges on the other side of Quezon Boulevard, a quick left turn down Bautista Street reveals the dilapidated and sorry states of what used to be grand mansions that once belonged to Manila’s rich and powerful. This house is more than a hundred years old. 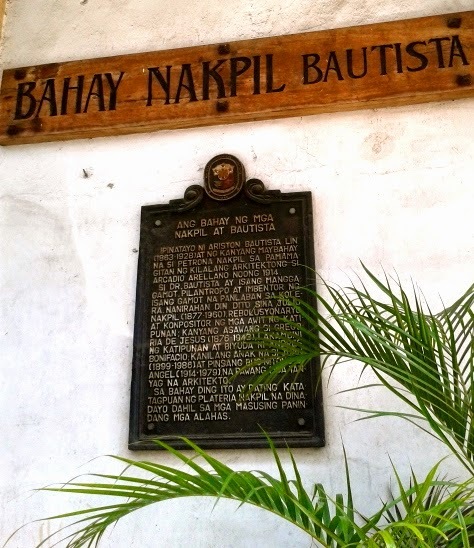 The house of the Nakpil-Bautista clan has been converted into a museum that preserves the mementos of its illustrious family members. The Nakpils were intimate to the figures and events that helped shaped the nation. Bonifacio’s widow Gregoria de Jesus later married into the family. A trio of paintings depicting her life with Bonifacio and Julio Nakpil adorned one of the walls. There are mini-exhibits that focused on the Katipunan and its members. There is a set of chairs which have seated Rizal et al during the founding of the La Liga Filipina in 1892.
to keep up with the Katipunan theme. 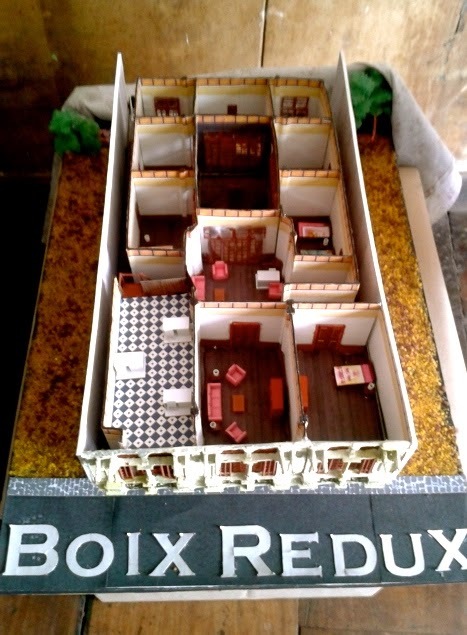 Next door and in a much sorrier state is the Boix House. The heritage house is owned by the Jesuits, and used to be a warren of rooms that nested nearly thirty impoverished families. A small group of artists and conservationist volunteers have been working tirelessly to clean up the over a hundred year old house and get it in a better shape before it all falls apart. to the Kapitbahayan sa Kalye Bautista. This rebulto needs to shape up. In that street, there is also a woodcarving workshop where religious sculptures are made. Sometimes, rebultos are also sent by their owners for repairs. 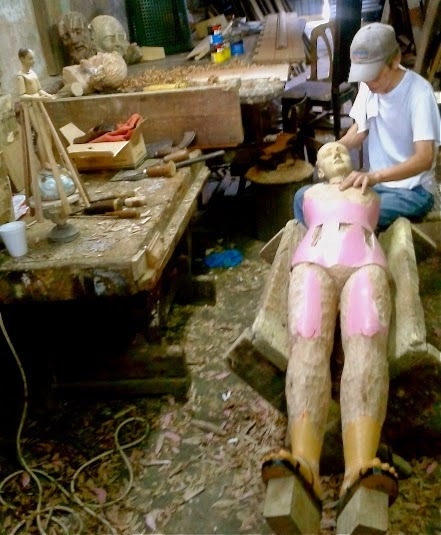 We found the father and son team working on a female wooden santo sculpture whose proportions were too big and had to be cut down to make it more female-like--basically, it’s like liposuction for sculptures. It’s fascinating what you find if you only know where to look. 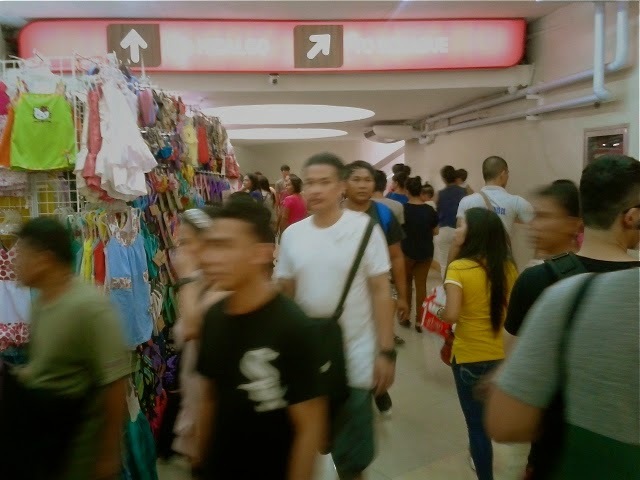 The tour group crossed the underpass back to Plaza Miranda and made our way to Ongpin for lunch at Ang Tunay Beef House. At one o’clock in the afternoon, it was already last call for orders before they close up for siesta. After eating, we went back to where it all started, at 98B. A closing chat was given by Ivan as to what else can be found in Old Manila that might serve as inspiration for Project Glocal’s artists and allies. Project Glocat and Friends thank you. Thanks to Ivan ManDy for the perspiring and inspiring walking trip and to BM Lab for the coverage and documentation. Until the next walking trip. 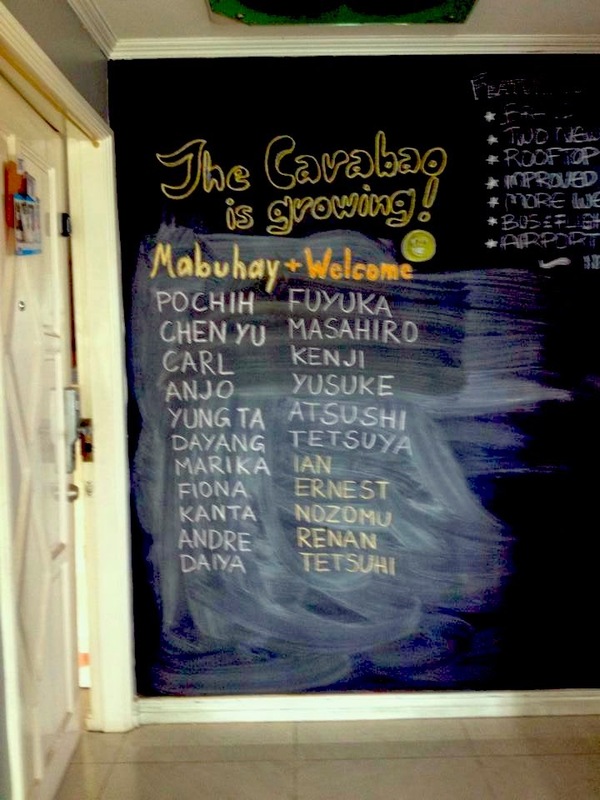 Red Carabao doesn't just provide a roof over the heads of backpackers travelling to and through Manila. It's also a growing community and a second home for Team Transient's artists and crew. Thanks for the warm welcome, Red Carabao! It will be a fun two weeks ahead of us. 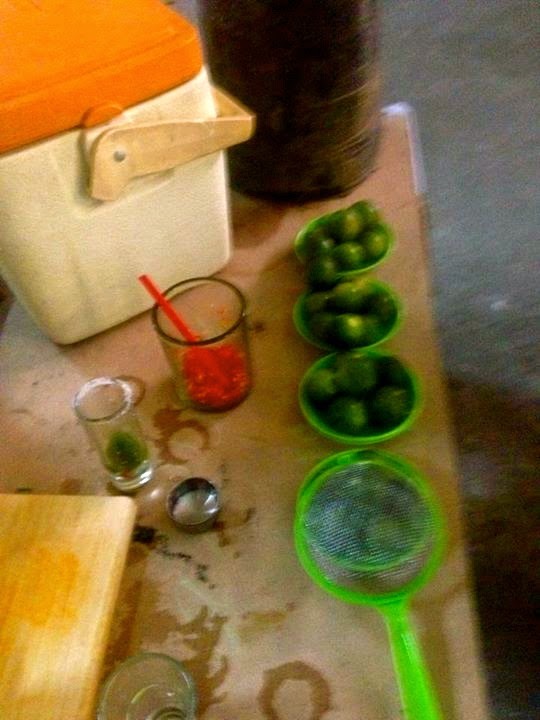 Red Carabao is at 2819 Felix Huertas St., Sta. Cruz, Manila. Check out their Facebook page here. Transi(en)t Manila kicks off tomorrow with the launch of HongKong artist Kwok Hin Tang's work at the Pan/// space at the Panpisco Building in Escolta tomorrow, 15 November, Saturday at 4PM. If you find yourself in the area early enough, there are also other things to check out in Escolta. Drop by 98B's Future Market at the First United Building, which starts at 9AM. Browse what's for sale, check out the art at Esc Project, and then stay for Kwok Hin Tang's opening. We promise it will be a blast. See you there! 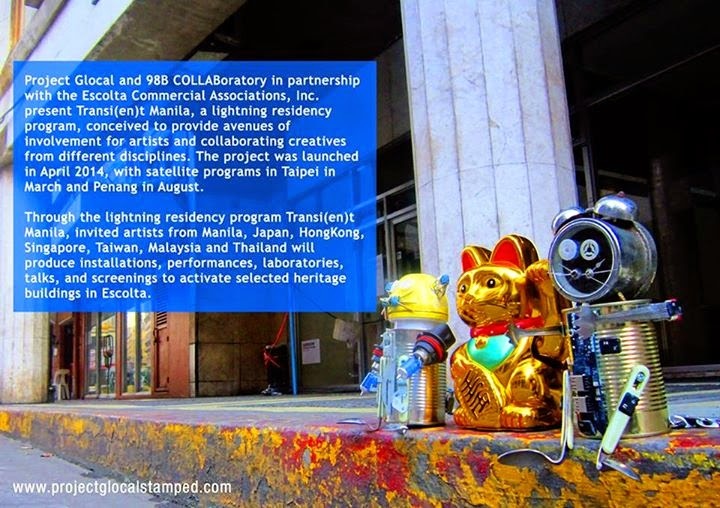 Project Glocal and 98B COLLABoratory, in partnership with the Escolta Commercial Association, Inc, present Transi(en)t Manila, a lightning residency program, conceived to provide avenues of involvement for artists and collaborating creatives from different disciplines. The project was launched in April 2014, with satellite programs in Taipei in March and Penang in August. 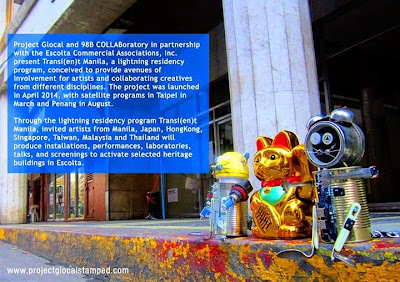 Through the lightning residency program Transi(en)t Manila, invited artists from Manila, Japan, HongKong, Singapore, Taiwan, Malaysia and Thailand will produce installations, performances, laboratories, talks, and screenigns to activate selected heritage buildings in Escolta. 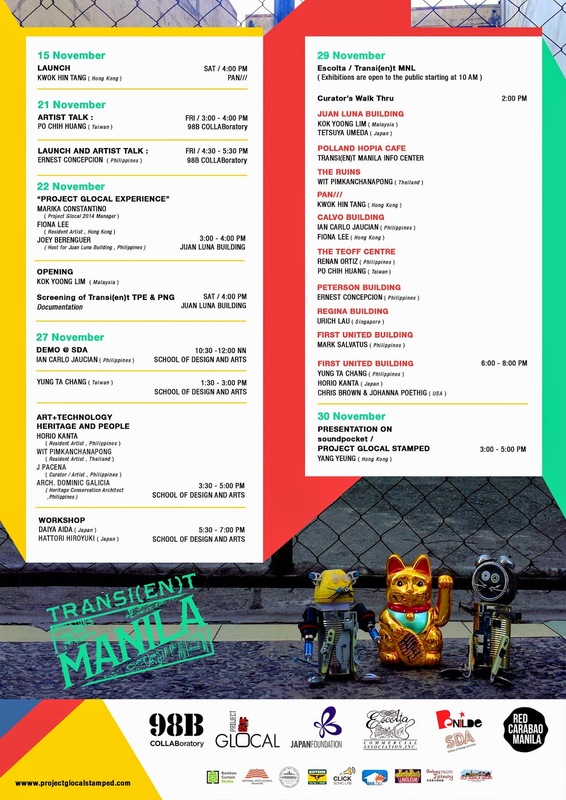 Transi(en)t Manila launches this Saturday, 15 November, in Escolta. See you there! Marika Constantino and Anjo Bolarda are working it until the sun goes down. Project Glocat with her two robo-rat suitors hanging out and having their photos around Escolta. Watch out for them in the coming days. 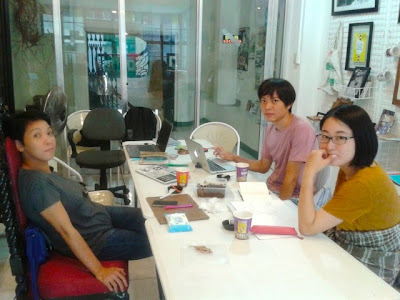 Curator Dayang Yraola, Yukie Mitomi and artist Umeda Tetsuya at 98B. Project Glocal people are so excited for the upcoming Transi(en)t Manila installment that we met up on a holiday weekend to start the preparations. Of course, no meeting is complete without a hearty lunch. Thanks, Yukie! 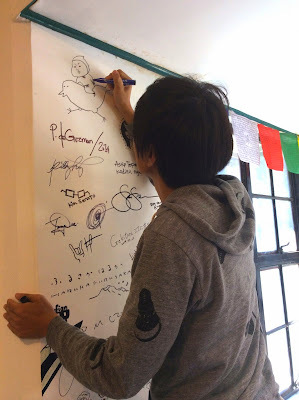 Umeda Tetsuya adds his doodle on the artists' wall at 98B. Then we trekked over to 98B to iron out the details of participating artist Umeda Tetsuya's residency. 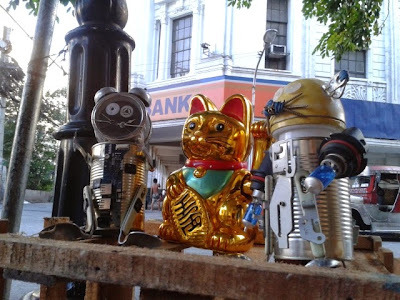 Meanwhile, Anjo and Marika headed out to take photos of Project Glocal's very lucky cat and her two robot suitors. Just another day at Project Glocal!